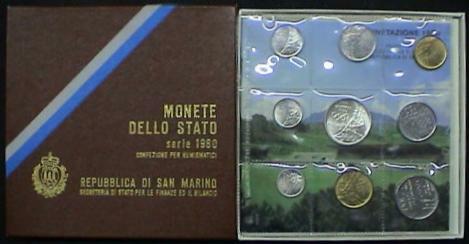 San Marino 1980 Mint Set of 9 coins, Brilliant Uncirculated condition, commemorating the 1980 Olympics and designed by artist Venanzo Crocetti. Includes a 500 Lire silver coin. In original Mint holder and includes original box and pamphlet describing each coin.